I was fortunate enough to watch this last night. A couple of awesome friends came over, we ordered a pizza and settled down for this Scandinavian treat from 2008. I didn't really know what to expect. I knew the general premise of the film but generally went in quite blind... and I loved it. The story pretty much goes like this. Oskar, a bullied, friendless boy, meets and becomes friends with the new girl next door, Eli. A mysterious, dark haired girl who doesn't get cold in the snow and vomits if she tries to eat sweets. The audience finds out before Oskar that Eli is a vampire and has been twelve years old for a long time. They fall in love, a sweet, childlike romance that gives each other what they're lacking. So, all in all, it's what Twilight should have been, haha! It's how a romance may go between a vampire (a real vampire mind you, a vampire that can only go out at night, cannot enter a house without being invited, can climb things with scary speed, is always cold, cannot reproduce like humans do... and most certainly do not sparkle) and a human. Although I'm a big fan of Anne Rice's vampires, what I appreciated most about this film was the return to the mythological vampire that we grew up with. The film is slow but I enjoyed that there was no rush to divulge all the secrets at once. The camera work is beautiful and truly, I would watch it again just so I could watch the work again. Snow covered Sweden looks fragile and beautiful, and the story telling is as cold as the weather filmed. And though it is cold, it is the frigidity of the story telling that makes the film so stark and difficult to watch. The boy who plays Oskar is pretty freaky though, if I'm honest. In fact, I found him more scary than Eli. Oskar is not a happy child, and the bullying has made him withdrawn and cold. He spends a few scenes in the movie pretending to face his bullies with a dagger. Lets just say, I watched this film imagining that Oskar was going to become A) a serial killer B) one of those high-school shooting people. Oskar finally gets the strength from Eli to finally stand up to the bullies who have been harassing him, this leads to a penultimate scene (the pool scene) that is beautiful and haunting at the same time. 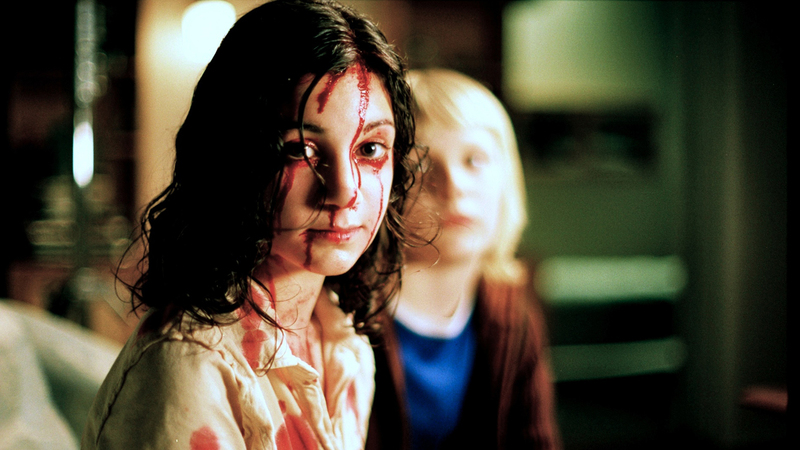 Let The Right One In is a movie for those who don't mind reading subtitles, who like purposefully slow storylines, romance, those who love awesome camera-work, haunting landscapes and a REAL vampire. Once I watch the American version Let me In  I'll let you all know what I think. OMG, you have to watch the American version! I loved it and i have been dying to watch the Scandinavian version for a while now. I read the book which was good and a little weird and watched the movie and I just love the relationship between the two kids. Thanks for this review! It reminded me to hunt for this version to watch. Yes! The relationship is just so epic! I found it so childlike which is missing from the majority of films these days!